Not sure what to feed your picky eater? Feeling overwhelmed with your responsibilities as a parent? Have questions about your baby’s sleep patterns? Creating Together regularly hosts a Public Health Nurse, a Community Health Worker and a Literacy Specialist, who can answer your questions and give you more information on early childhood development. Please check our Calendar to see when they will be in. Join us for educational workshops and sessions on a range of subjects related to children’s and family wellbeing. Workshops focusing on children’s social skills, early literacy, early childhood development, health and physical development are delivered by highly qualified facilitators who provide their services free-of-charge. 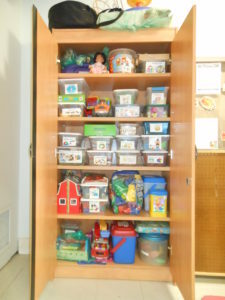 Parents and caregivers can borrow a variety of toys, books, and educational videos to use at home. These resources extend learning and development opportunities for both children and adults.